1) is my Wowza Wednesdays. I feel like half way through the work week, or mom week, is worth acknowledging. So, my Wowzas are recognizing something that mid-way has made me smile, chuckle, laugh, cry…there are no rules! I would love for you all to share with me something that has made you feel something worth mentioning. Send them to me at brimoysa@emersongreydesigns.com and I would love to features yours after mine. If you take a look back at my Wowzas, they aren’t anything spectacular…so don’t be shy. 2) is to leave comments. I love comments. Thank you to those of you that leave them often. It is a constant reminder that this is being seen by a few of you, hopefully someday, by many. 3) is to contact me for my services…duh, right? =) I’m not sure what avenue you have found my site through, but I’m glad you have stopped by and hope that I can be of some assistance. Okay…now that that is over…lets chat about ways to display books in a room. We all want our kids to be good readers, have that intellectual imagination strengthened and books are the greatest gift to that. But how can we display the enormous amount of books we accumulate over the years in a cute way? A while back I posted how I put picture ledges up in my kids room. I love this option because it allows for open floor space and yet you can still display your favorite books. I just love this idea, using an old cable spool and turning it into a new library table, it can also act as a craft/art table for the kids. You must head over to Reading is Fashionable and check out the tutorial. I also saw this and thought…hmmm that could easily be a fresh way to organize and display books. 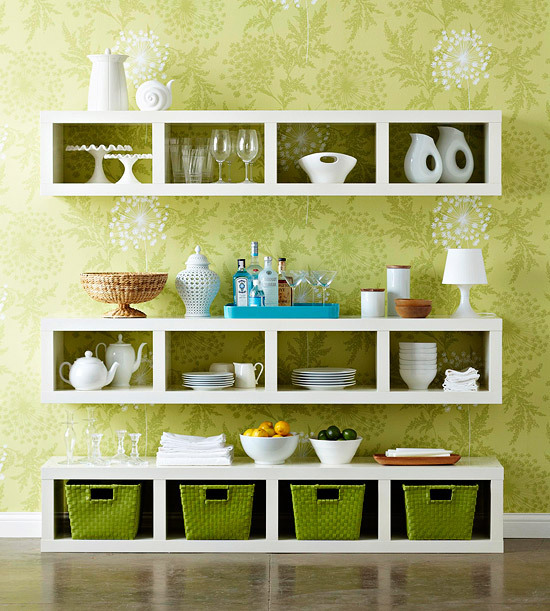 Better Homes and Gardens was showing it as a way to display your china…but, I like it for a kids room. Baskets on the bottom, books, toys etc. The spacing from one shelf to the other is what I really like. It truly created a ‘piece of furniture.’ Got to love Ikea Expedit bookcases. I’ve always been drawn to this idea. I love the asymmetry and the numerous possible color options and combos you could customize it with. You can see the tutorial here, but I am sure you could tweak it so many different ways. The concept itself is super fun. How about a flea market find…I want to run to the nearest one and see what treasure I can find. How great is this spinning rack? Even better is the room that it calls home. For a play room or a boys room how fun would this locker console be? It also comes in red. Too fun and could grow with them for awhile. The possibilities are endless. I think the fun is finding a newer way to do it, making books more then just books. Making them a feature in a room. How do you display the books in your kids rooms? my favorite is still the shelf…no floor space taken up. I love how Emme can get her favorite books!